My big kids love cheesecakes , chocolatey chocolate cakes, tiramisu, fudgy brownies etc. So I'll bake/make some of these 'sinful sweet treats' once in a blue moon and on rare occasions ... just for my 'know-how' to bake these sweet treats and to 'please' their request. I've made them non-bake cheesecake Eggless non-bake Cheesecake. Of course, they have asked when will I bake them cheesecake (cos they knew mom is not very fond of cheese and can't bake cheesecake hee .. hee). I've missed a few bake-along sessions with my cyber blogger pals. 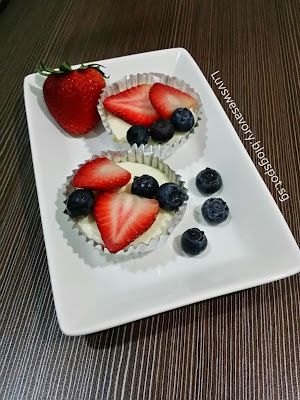 Here's sharing this creamy yet light and low-fat baked mini cheesecake in this Bake-Along #78 - theme cheesecake. Below my slightly modified version and I've halved the recipe to bake 6 cupcakes. 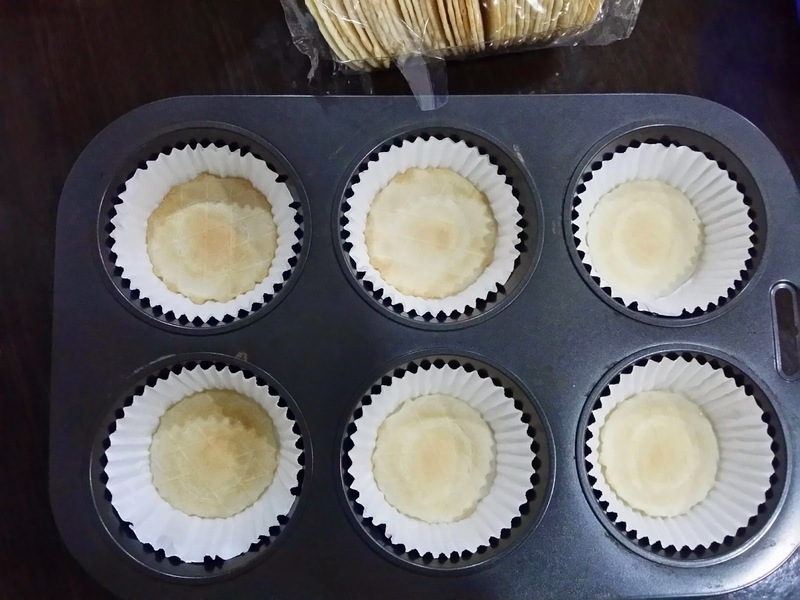 Line cupcake tin with liners. Place a wafer cracker at the bottom of each liner. 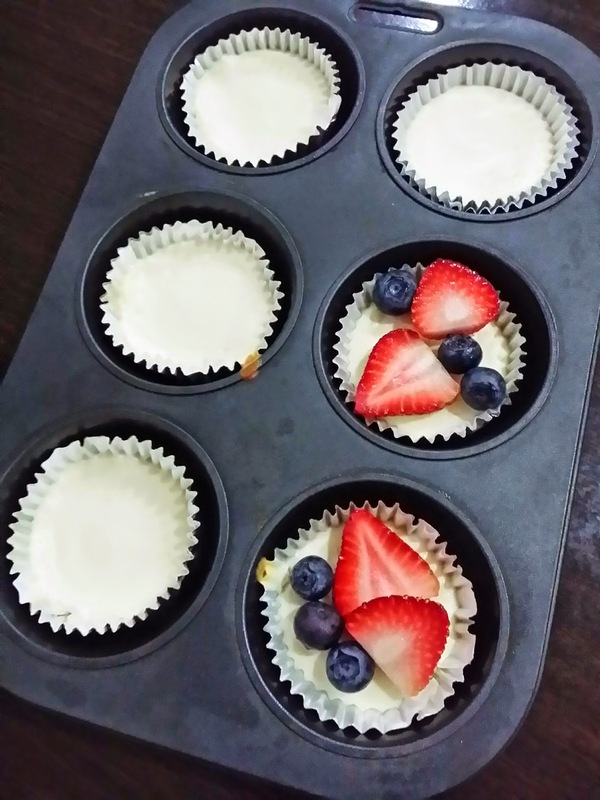 Gently beat cream cheese, sugar and vanilla until smooth using an electric mixer. 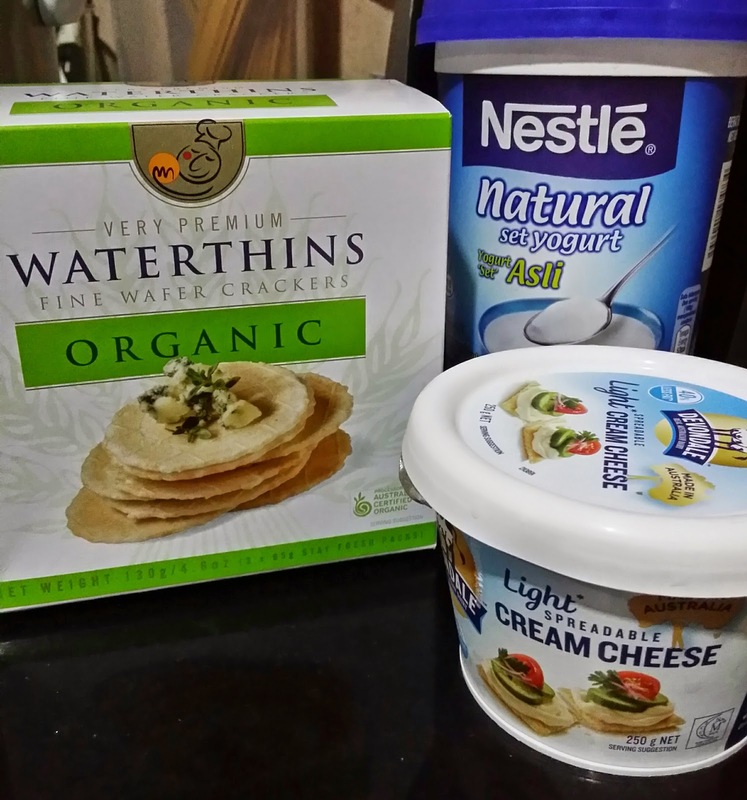 Gradually beat in yogurt, egg white, and flour. Do not over beat. Pour into cupcake liners filling half way. Bake 20 to 25 minutes or until center is almost set. Cool to room temperature then chill at least 1 hour in the refrigerator. Before serving, top with some fresh strawberries and blueberries. My big boy had two at one go ... he claimed very nice. My girl enjoyed it but very disciplined to just one cupcake. My mother in-law ate one and commented it tasted very nice. 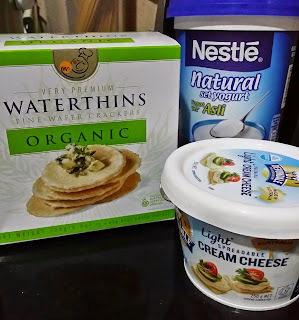 While I definitely need to try one ...hmm.. creamy yet light and not too cheesy. It's soft texture with berries tasted wonderful good! But if you're looking for the dense and rich classic New York style cheesecake with a graham cracker crust and high sides ... this is not that kind of cheesecake. My big boy gladly finished the balance of one cheesecake cupcake the next day. Happy Bake-Along 4th Anniversary ! 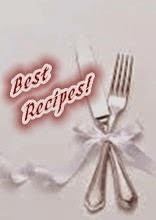 Linking this post to Bake-Along event, hosted by Joyce, Lena & Zoe. 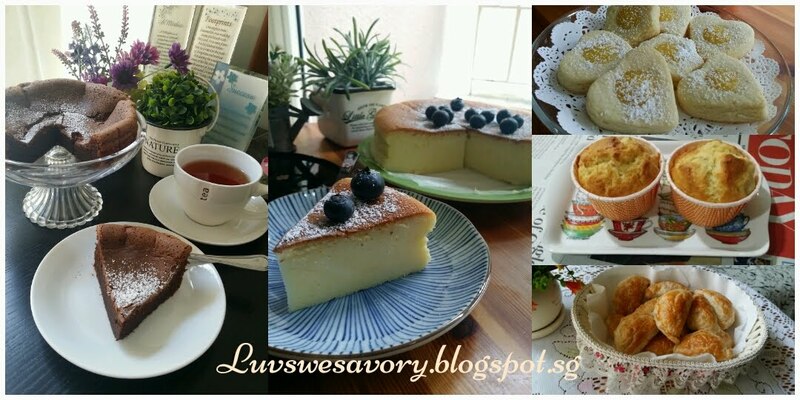 This post is linked to the event, Little Thumbs up organised by Doreen from my little favourite DIY and Zoe from Bake for Happy Kids, hosted by Cheryl from Baking Taitai at this post. 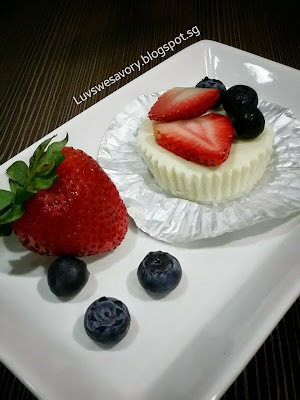 Linking to the Best Recipes for Everyone May 2015 Event (Theme: My Favourite Desserts) organized by Fion of XuanHom's Mom and co-hosted by Aunty Young. lovely! and simple to make too! 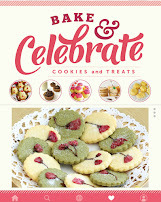 thx for linking this with bake along and Happy mother's day to you! Hi Karen, this is lovely! 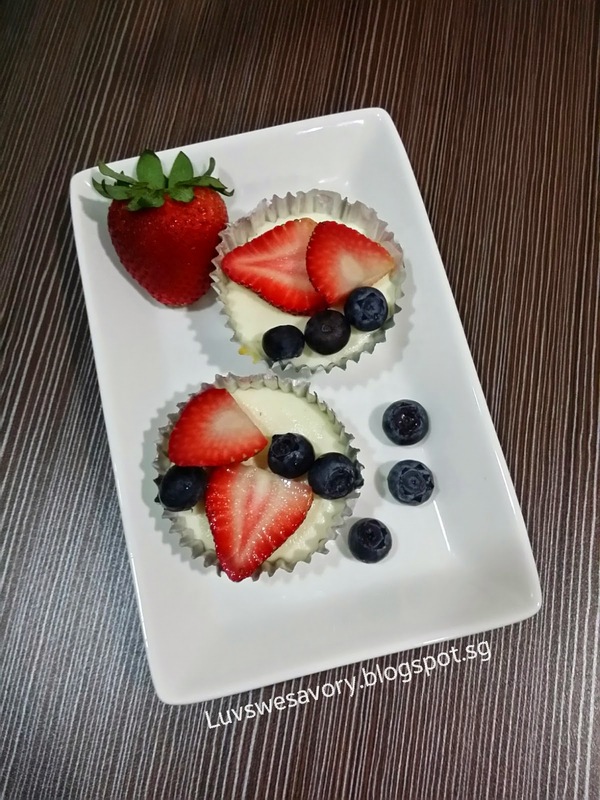 I like the mini mini fruitty cheesecake. Let's do more! Hi Karen, love your cheesecake! Thanks for linking with LTU and wishing you a Blessed Mother's Day too! I love cheesecake. Your mini cheesecake very cute and look so yummy. Hi Karen, nice cute fruity cheesecake! Do submit this cheesecake to the BREE event too, since it is considered as a dessert.I hope you would support the even again, thanks in advance! Oh cheesecake cupcake is eligible ... ok ok will surely support BREE ^-^! You did well... Nice that you have made these not-harmful-but-delightfully-delicious kind of cheesecake. Very lovely! Karen, your cheesecakes are so lovely! I don't mind having one myself! Looks yummy! Hi Karen,sorry for my late visit,i had missed out this yummy cheesecake...OMG! !